Become a LATICRETE Product Champion of Your Store! Last month NSW LATICRETE Technical Sales Rep, Craig Hunter, and LATICRETE Australia Technical Service Manager, Fred Gray, held an exclusive Reece Irrigation Training Day, at the LATICRETE Technical Training Centre in Smeaton Grange, NSW. All those who attended received a LATICRETE Training Certificate and are now trained up to be the LATICRETE product champions of their stores! For more info on our upcoming LATICRETE Seminars and Trade Events happening around your area soon, check out the Seminars page on our website, or keep up to date with the Trade Events by following us Facebook. Contact us to arrange training, a demo or for technical support, call 1800 331 012 or emailsales@laticrete.com.au. Tipping floors found in waste transfer stations and material recovery facilities (MRFs) undergo attacks that are extreme and unique to the solid waste industry. In fact, there isn’t a more abused floor than one found within this space. The attacks come in three forms: abrasion, impact and chemical. The front-loaders from the tractors cause the abrasion and impact, and the waste leachate creates the chemical attack on the concrete surface. In Hillsborough County, Tampa USA, the existing concrete at the transfer waste centre had worn down as far as the rebar in certain areas - 100 mm in elevation - and was nonexistent in some spaces. Cornerstone Construction Services (CCS), an Orlando-based concrete contractor, was awarded the project. CCS had half the floor to work with at any given time. The other half remained operational. This created logistical difficulties working around heavy equipment. Another challenge the CCS crew encountered was environmental. 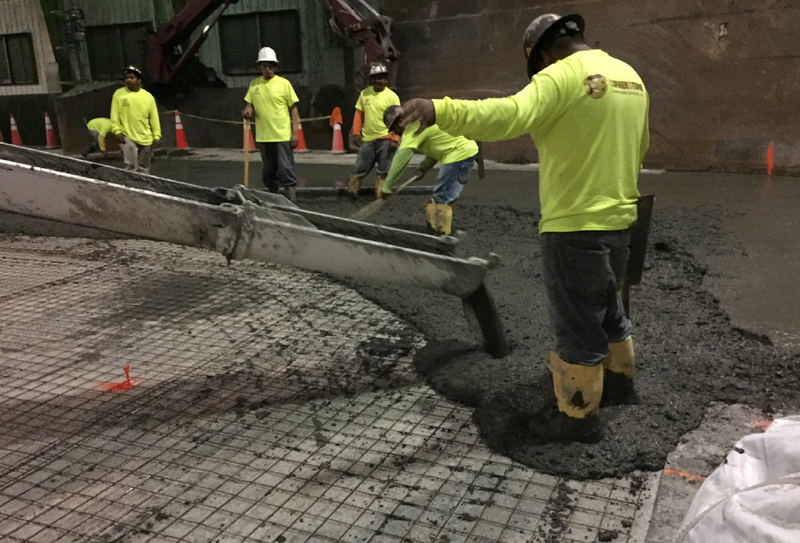 Florida temperatures in the summer are not conducive to good concrete or emery topping placement projects. Therefore, they mixed and placed the new topping at night, when temperatures were at their lowest. resulted in a damaged, delaminated membrane. Moisture Vapour and Damp Substrates With Membranes. "As we have progressively moved out of the hotter drier weather patterns to more prolonged warmer and wetter or damper conditions, we are starting to see the re-occurrence of a range of issues we have not seen for a while. In particular these resultant warmer, damper, wetter substrates and backgrounds can be problematic with the application of most waterproof membranes. The wetter conditions when combined with warmer temperatures accelerate moisture vapour transmission rates that get trapped under the membrane. 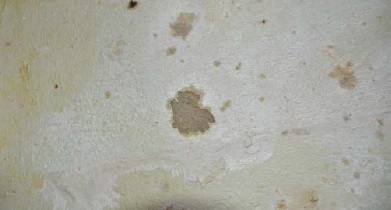 The transmission of moisture vapour in the substrate under the membrane usually manifests as bubbles in the membrane which means isolated debonding of the membrane occurs. 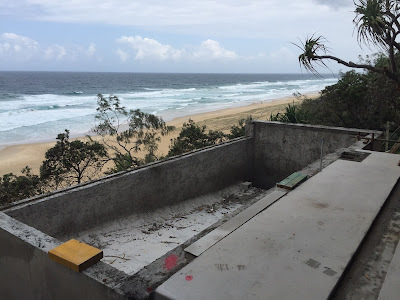 So how do we avoid these issues - protection of the works from the elements and allowing drying moisture equalisation is the best way, however construction schedules don’t allow for this, so the use of moisture shielding is considered the pragmatic way to mitigate high moisture vapour rates. LATAPOXY® Moisture Shield should be used on all work exposed to these conditions." Click here for the LATAPOXY Moisture Shield Data Sheet. For more information or for Technical Support call 1800 331 012 or email sales@laticrete.com.au to arrange a demo or a FREE sample. LATICRETE provides industry leading, innovative installation materials, methods and technologies for building installation systems. LATICRETE will be at the premier international trade event and expo in Orlando, Florida, dedicated exclusively to showcasing the newest in ceramic tile and natural stone. Join us for demonstrations and information seminars on the latest industry products! To discuss your next project, for technical support or to arrange FREE samples or a demo, call 1800 331 012 or contact us here. 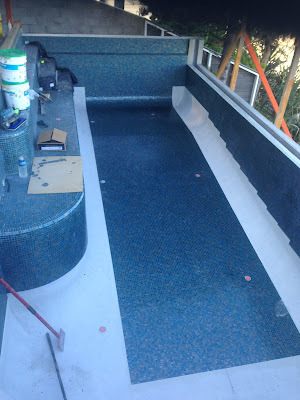 Thanks for sharing this project with us Blair, we can't wait to see the finished result! Last year we shared in the progress of a great looking walkway and pond project on the go in Noosa, QLD, by Don Macdonald and his team at The Orchid Group. 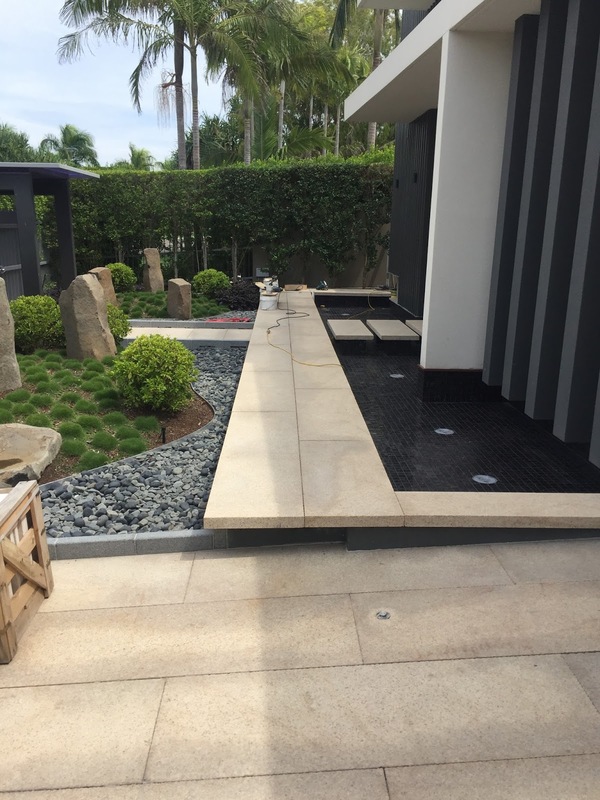 The project is progressing nicely and consists of a walkway and stairs laid with travertine, an entry path laid with granite, and a pond featuring Bisazza mosaics. STRATA_MAT™ - a next generation high performance uncoupling mat for use under tile and stone installations for both residential and commercial applications. 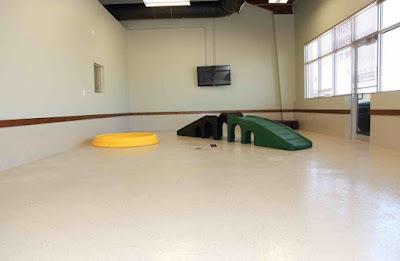 Designed to replace traditional underlayment materials. LATAPOXY® SP-100 - a stainless, pigment free, colourfast epoxy grout for grouting floor installations of ceramic tile, brick, and stone. Can be used for interior and exterior applications. SPECTRALOCK® PRO Grout - a patented, high performance epoxy grout that offers colour uniformity, durability and stain resistance with extraordinary ease of use. Designed for use on ceramic tile, glass tile and stone applications, both residential and commercial. 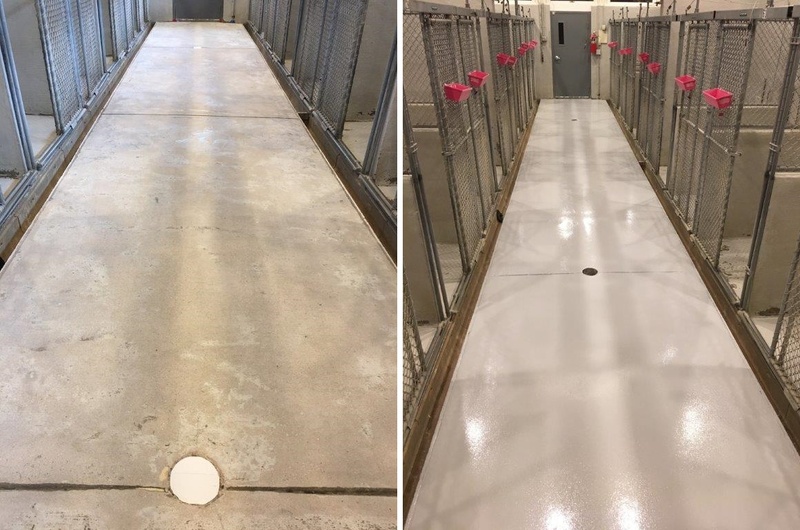 Did you know LATICRETE SPARTACOTE™ has a concrete coating system which is an excellent choice for dog kennels and animal care facilities? SPARTACOTE FLEX PURE CLINICAL PLUS coating system offers silver ion antimicrobial technology to mitigate harmful bacteria and odours such as pet urine. 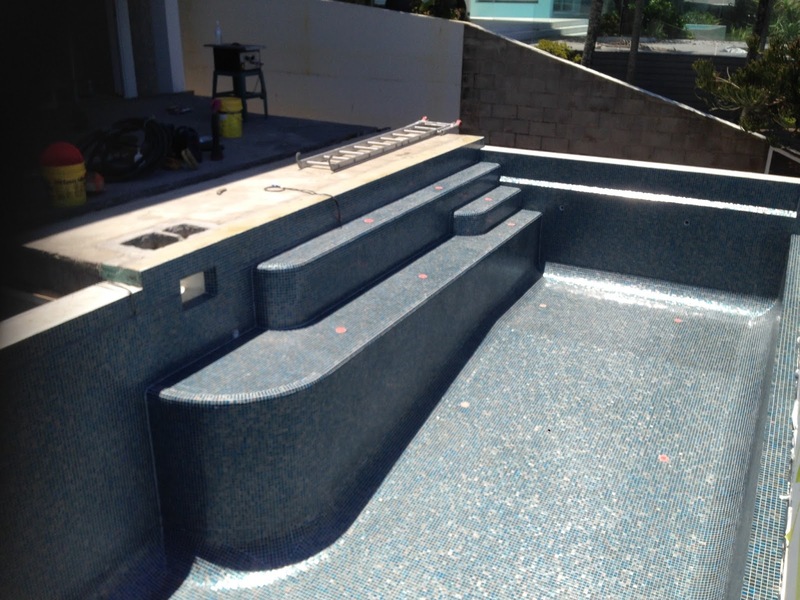 It acts as an added layer of protection within the SPARTACOTE concrete coating system for prepared surfaces. These systems offer animal facility owners customisable colours and textures, and fast return to service. 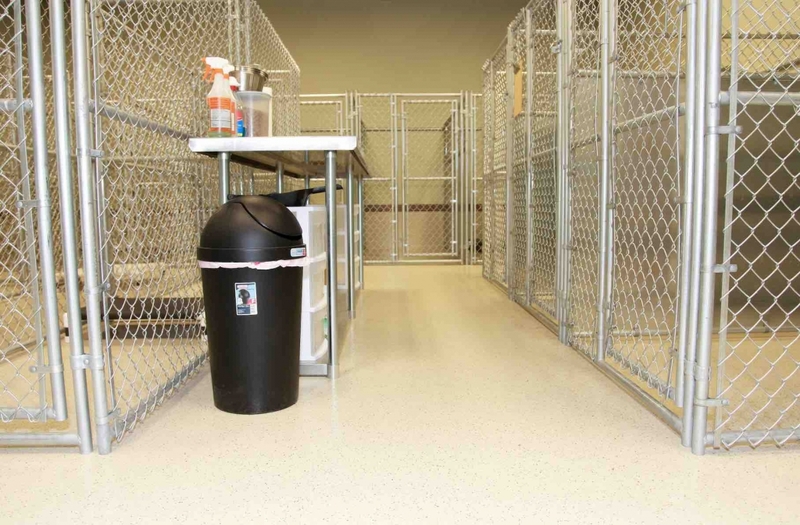 SPARTACOTE PURE Clinical Plus is tested, vetted and proven in environments where cleanliness is a top priority, such as hospitals, clinics, animal shelters, veterinary facilities, pharmaceutical production areas, bathrooms, locker rooms, and food production. Coatings applicator, Collins Concrete Coatings, in Ashburn, USA, recently applied SPARTACOTE CLINICAL PLUS coating in a dog kennel in Leesburg. 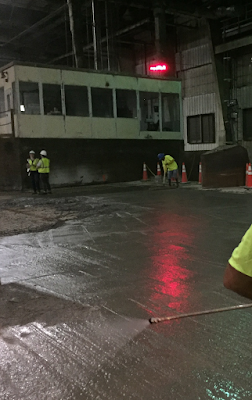 This coating system included a base medium gray coat. 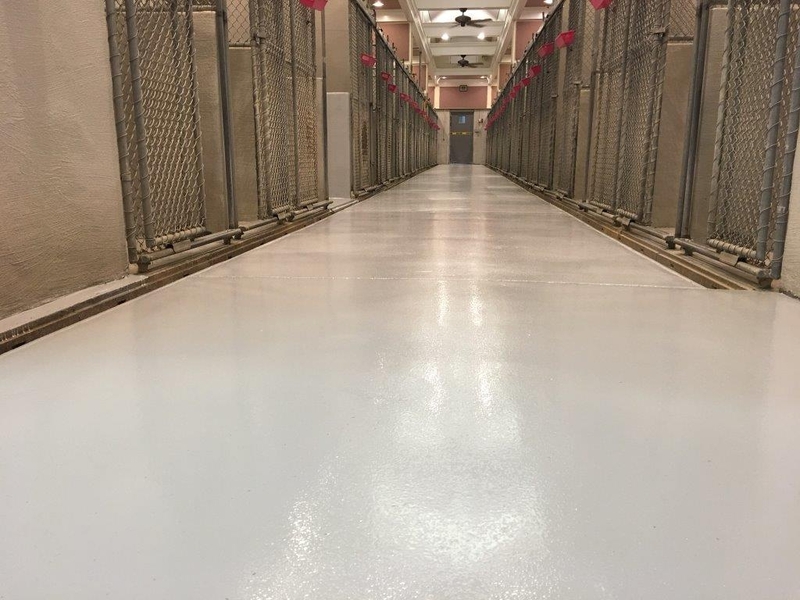 It was then top coated with CLINICAL PLUS Clear, giving the floor excellent abrasion resistance, easy to clean properties, and silver ion antimicrobial technology. The project was approximately 112m2. Read the full story here. The Tasmanian Independent Builders Association (TIBA) gets behind their members to ensure they are adhering to the National Construction Code across Australia. There are regulations and standards that are just not negotiable and one of them is Internal & External Under Tile Waterproofing. LATICRETE is committed to education and training and have collaborated with TIBA to educate and train their members in Tasmania. Erin Fraser, LATICRETE Technical Sales Rep and Neil Warden spent time in Ulverstone, Hobart and Launceston, training TIBA members on Internal & External Under Tile Waterproofing using HYDRO BAN® a thin, load bearing waterproofing/crack isolation membrane. TIBA members who attended the training were taken through the regulations and standards, contractor responsibilities, waterproofing issues and had the opportunity to gain hands-on experience with HYDRO BAN. At the end of the training, learners were assessed and accredited in using HYDRO BAN. Are you or your team up to date on the regulations and standards on Internal & External Under Tile Waterproofing? Contact us to arrange training for you or your team - email: technicalservice@laticrete.com.au or call 1800 331 012 for more info. This little guy is ready for a swim! We are excited to share the QLD Spring Hill Plunge Pool Project we have been blogging on is now complete and looks amazing! 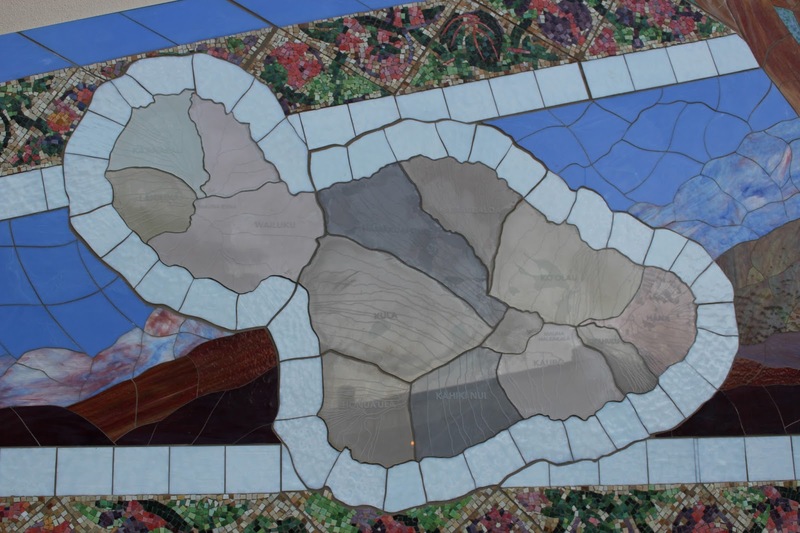 This beautiful glass mosaic pool was installed by Sam Gardener from Sam Gardener Tiling, is filled up and ready to be enjoyed. 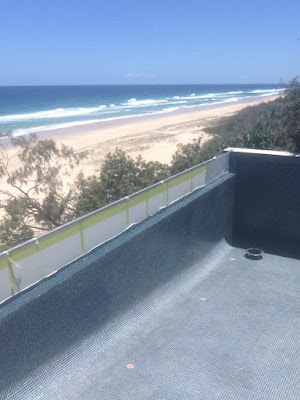 LATICRETE QLD Technical Sales Rep, Mitchell Haw was on the project site to hand over the 15 year LATICRETE Pool Tiling Installation System Warranty to the owners! 226 Thick Bed Mortar - A factory prepared blend of carefully selected raw materials, Portland cement and graded aggregates. 226 Thick Bed Mortar was designed for use with 3701 Mortar Admix to produce a latex Portland cement mortar that has exceptional strength. SPECTRALOCK® PRO Grout - A patented, high performance epoxy grout that offers colour uniformity, durability and stain resistance with extraordinary ease of use.Designed for use on ceramic tile, glass tile and stone applications, both residential and commercial. 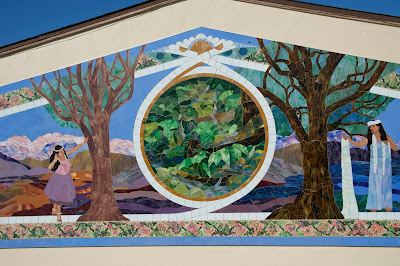 Credits: Hawaii State Foundation on Culture and the Arts. 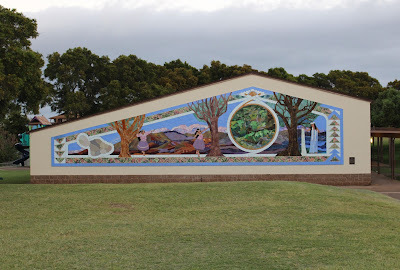 This incredible Hawaii State Foundation on Culture and the Arts stained glass mosaic 14'x52' mural was installed for the Pukalani Elementary School in Hawaii. 260 school children and community members helped to create the lei aloha border and the remainder was completed by artist, Calley O'Neill, installer Isaac Homza & the team at Higher Standard Tile & Stone. 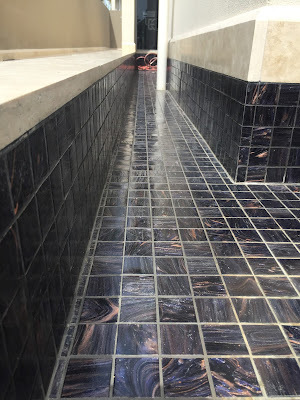 This project took almost 2 years to complete from inception and has been installed using a range of LATICRETE materials including 254 Platinum (previously 345 Platinum) and PERMACOLOR® Select grout. PERMACOLOR Select was used to show the different parts of the island with 5 different colours. The panels of the mosaics were then attached to the wall with 254 Platinum. 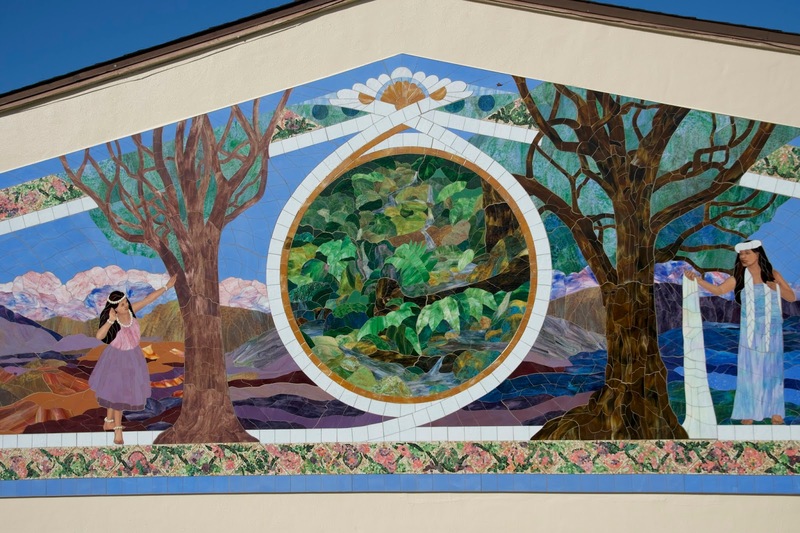 'The mural seeks to inspire children to nurture their connection with each other and the land, teach the children who they are, where they come from, and how to support life, so that they can communicate this and pass it on to the next generation. The children that understand this will become wise and great innovators and leaders, for there is great work to be done to create a healthy and truly abundant future. There is infinite potential for all the children and their children’s children to thrive and make a positive difference in the place we love the most - home!'. - Calley O'Neill. 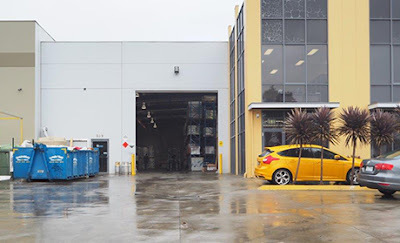 Bayset Campbellfield Now Stocks LATICRETE! We are excited to extend a warm welcome to the Bayset, Campbellfield team in VIC, as a preferred LATICRETE stockist. Head down to the Campbellfield branch and chat with the friendly team at Bayset about LATICRETE tile and stone installation materials. QLD: Coopers Plains, Geebung, Burleigh Heads and Warana. In a technical article featured in Tile Today #92, Fred Gray, LATICRETE Australia Technical Service Manager, provides an informative discussion on the importance of trowel selection and the direct influence it has on the outcome of the tile project. 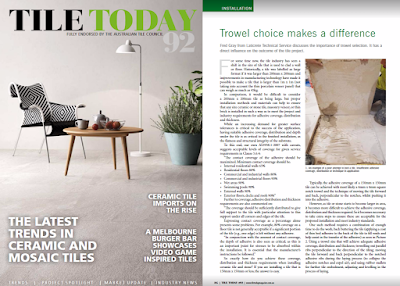 "For some time now, the tile industry has seen a shift in the size of tile that is used to clad a wall or floor. Historically, a tile was labelled as large format if it was larger 200mm x 200mm and improvements in manufacturing technology have made it possible to make a tile that is larger than 1m x 1m (not taking into account the thin pocelain veneer panel) that can weigh as much as 45kg. In comparison, it would be difficult to consider a 200mm x 200mm tile as being large, but proper installation methods and materials can help to ensure that any size ceramic or stone tile, masonry veneer, or thin brick is installed in such a way as to meet the project and industry requirements for adhesive coverage, distribution and thickness. 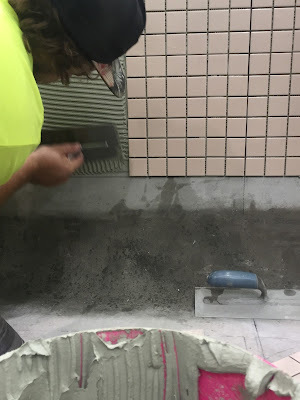 While an increasing demand for greater surface tolerances is critical to the success of the application, having suitable adhesive coverage, distribution and depth under the tile is as critical to the finished installation, as the flatness and structural integrity of the substrate." Click here to continue reading. For more information or for technical support, call LATICRETE on 1800 331 012 or email: sales@laticrete.com.au. Chat to us and arrange a demo or a FREE sample. Erno de Bruijn, President & COO of LATICRETE Int. Last week Emma Tschannen, General Manager and Neil Warden, National Sales Manager from LATICRETE Australia spent time in India attending the International Management Meeting which hosted LATICRETE team members from all over the globe. Featured in the above photo is Daniel Rothberg and Simone Meadows, 3rd generation of the Rothberg family, and employees of LATICRETE Int., had also attended the meeting. The group had the opportunity to experience some of the local traditions by learning an Indian dance and practicing yoga! MVIS™ - Masonry Veneer Mortar is a patented, versatile polymer fortified mortar designed specifically for the installation of adhered masonry veneer, stone and thin brick. A high performance mix provides maximum non-sag performance for vertical installations and also obtains maximum bond strength to the substrate and selected veneers. PERMACOLOR® Select - High performance cement grout. is an advanced high performance cement grout that offers the industry’s first dispersible dry pigment solution. PERMACOLOR Select is designed for virtually all types of residential and commercial installations and offers optimum performance on the most demanding exterior or interior applications. 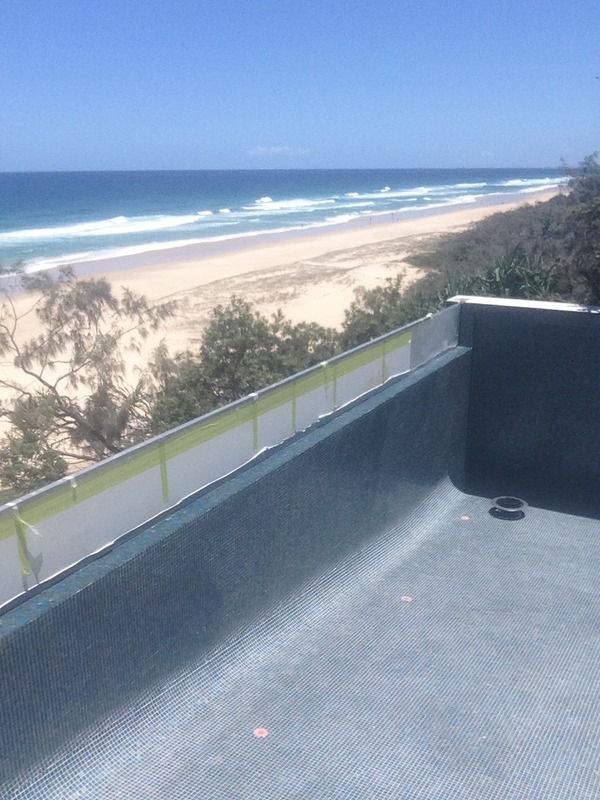 This fully tiled pool in Sunshine Beach, QLD has been under construction by Jack Boyd Pools and Calty Construction. 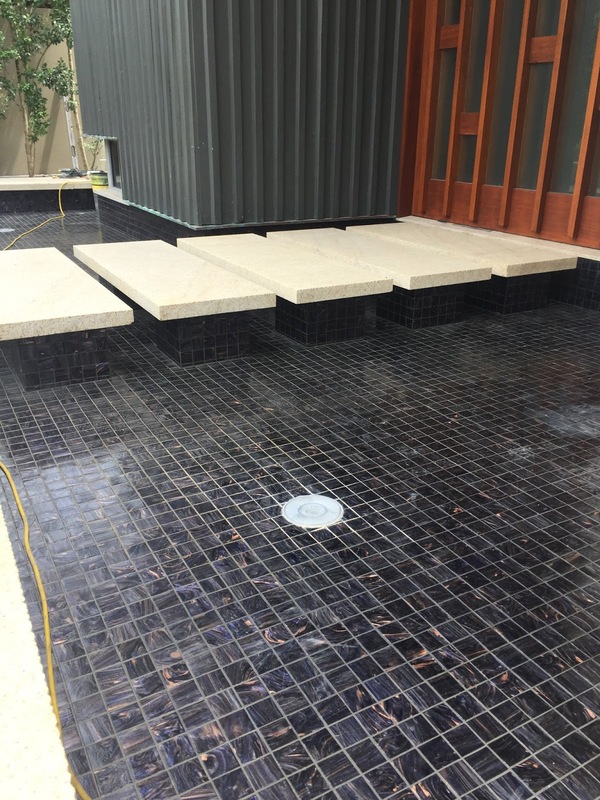 The 80m2 pool features 20x20 Bizazza glass mosaic tiles and has been installed using a range of LATICRETE materials to qualify for a 15 year system warranty! 226 Thick Bed Mortar - a factory prepared blend of carefully selected raw materials, Portland cement and graded aggregates - designed for use with 3701 Mortar Admix to produce a latex Portland cement mortar that has exceptional strength. HYDRO® BAN - a thin, load bearing waterproofing/crack isolation membrane that DOES NOT require the use of fabric in the field, coves or corners. LATASIL™ 9118 Primer - a one component primer designed to increase adhesion of LATASIL to various substrates. For all underwater and permanent wet area applications such as pools, fountains, showers, tubs, spas, saunas and steam rooms. Click here to view/download the LATICRETE Swimming Pool System Warranty. Contact us to discuss your next project, arrange a demo or FREE samples by calling 1800 331 012 or contact us here. 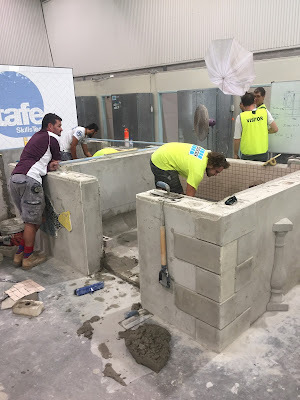 LATICRETE QLD Technical Sales Rep, Mitchell Haw, was invited to spend time and train tiling apprentice students at TAFE Queensland SkillsTech in Acacia Ridge, on LATICRETE products. 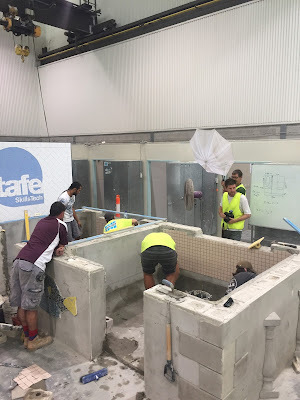 Time was spent in the classroom discussing LATICRETE Pool Installation Systems and Warranties. 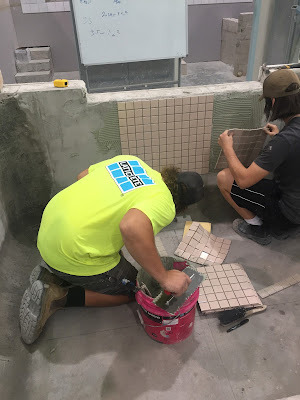 The students actively participated in hands on training using LATICRETE products such as 335 Premium Flexible Adhesive and SPECTRALOCK® PRO Grout. SPECTRALOCK PRO Grout is a patented, high performance epoxy grout that offers colour uniformity, durability and stain resistance with extraordinary ease of use. SPECTRALOCK PRO Grout is designed for use on ceramic tile, glass tile and stone applications, both residential and commercial. It can be used both interior and exterior on floors and walls. 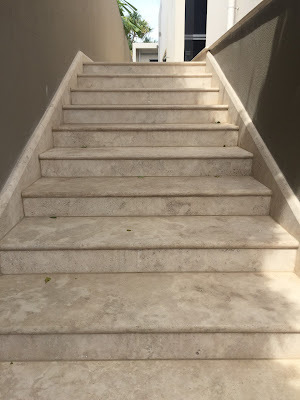 Concrete Flooring Doesn't Have to be Boring! 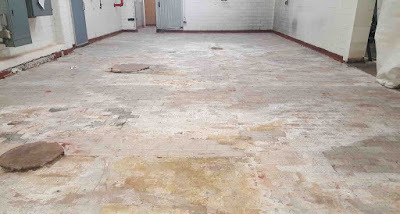 Recently a snack food manufacturing facility required renovations to their flooring. The project required heavy surface prep, which included removing approximately 140m2 of existing brick flooring then grinding the surface to prepare it for the application. 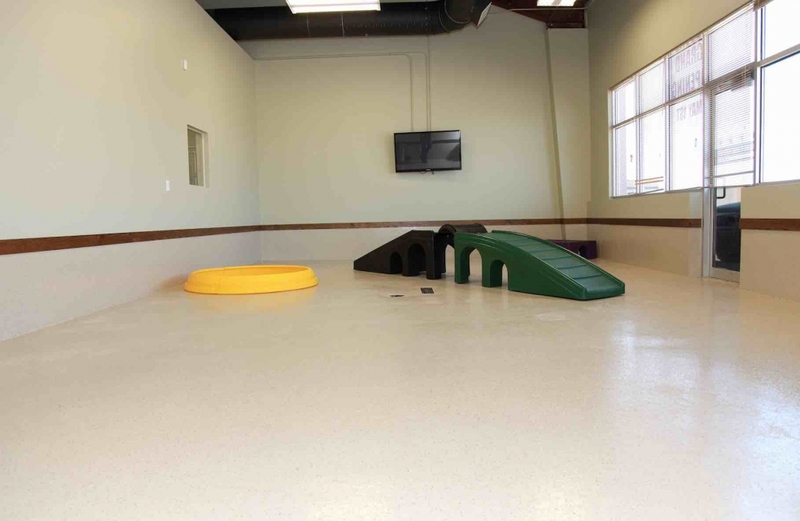 Conctrator company, Minster Concrete Coatings chose LATICRETE SPARTACOTE™ Quartz™ for the flooring application. Once the quartz broadcast had cured the crew vacuumed the excess quartz from the surface. 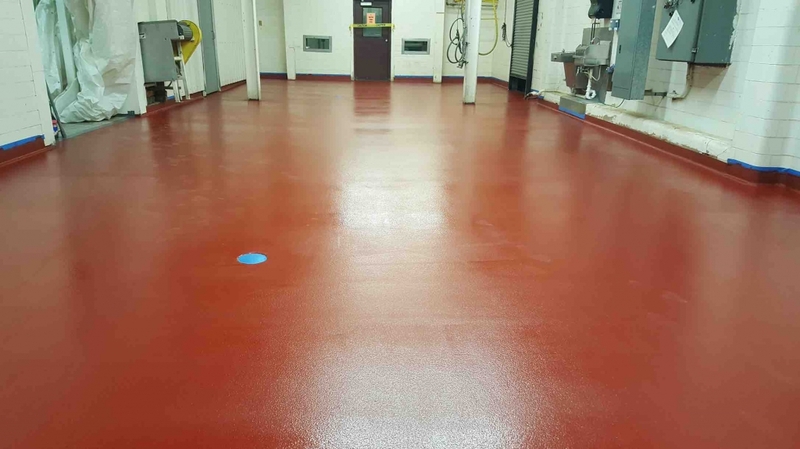 Next, they applied SPARTACOTE SURFACE BUILD SL, which is employed to ensure added thickness in certain applications like food manufacturing and breweries. After the coatings crew allowed the SURFACE BUILD SL to cure, they applied a final top coat of SPARTACOTE FLEX SB pigmented red to lock in the colours and textures, and to finish the system. Read the full Project Spotlight here. H&M in Aus used LATICRETE! That's a Lot of LATICRETE!